Happy Fathers Day to all the dads out there! I hope you got some good arty presents or cards. @ Palm House, Sydeny Royal Botanica Garden, Mrs MacQuarie’s Chair Rd. 24 hour fault report – Dirk Kruithof. @ Chrissie Cotter Gallery Pidcock street Camperdown, (off Mallett street). OutSpoken – Featuring Tug Dumbly, Robert Gray, Tami Sussman, Stackhat and more…. Applications are now open for the Kudos Annual Emerging Artists & Designers Award. exhibition and judging 17-28 September, with winners announced at the opening. Pick up an entry form today from the ARC Office. Check out gamba gamba at the tate gallery, officially opened by Her Excellency Governor of New south Wales Marie Bashir. gamba gamba is stories from HopeVale, remote Cape York curated by Joel Dickens. There is also Martine Emdur’s solo show at OlsenIrwin Gallery and Remnim Alexander Tayco showing with Conductors project at St James and Musuem stations. gamba gamba – Stories from HopeVale, remote Cape York. Brings together the students of NAS, SCA and COFA. @ Gallery Red, Shop 11, 131-145 Glebe Point Rd, Glebe NSW 2037. Gallery Red is now accepting proposal for 2014 exhibitions. DIRTY LITTLE SECRETS – ARTIST CALL OUT!!! PLATFORM72 is calling for expressions of interest from artists to install artworks and/or performance art at the Oxford Art Factory for Art & About 2013 (20 September to 20 October 2013). Are you a painter, sculptor, installation artist, performance artist, VJ, DJ work in new media, film or projection? We want you to think BIG & out of the box! You can perform or install a work you have already developed or send us an idea for what you will create. Browse the event album for images of the spaces on offer. The Cube is also available throughout. Selected artists will be invited to meet at OAF on Wednesday 4th September to discuss their projects and to collaborate with other artists. Works to be considered for a specific space within OAF – please see attached for available spaces. Budget: A small budget or sponsorship of materials may be available so please indicate requirements. All media and formats encouraged. The theme for this years Art & About is Private Lives – Public Spaces. PLATFORM72 will be curating artworks & performance nights at OAF which explore the idea of Dirty Little Secrets, a public confessional. We are looking for artworks & performances that address this theme in a wide array of mediums and ideas. We are encouraging the creation of an immersive environment throughout the Gallery Bar. In conjunction with East Sydney Creative & the City of Sydney we will be hosting events on Wednesday nights for the public to engage with your artworks. We are looking for artists, performers, VJ’s & DJ’s to collaborate on these nights. These will be promoted heavily through the City of Sydney and Art & About. The public will be able to see your artworks throughout the month of Art & About. Artworks will need to be dismantled on Sunday 20th October. Artists are encouraged to visit the Oxford Art Factory Gallery Bar to check out the spaces available. It is open Wednesday to Sunday from 8pm and is free entry. The Open Day is a fantastic opportunity for you to meet our staff, visit our extensive studio and workshop facilities, and find out about our undergraduate and postgraduate degrees. You can also find out about the new Bachelor of Visual Arts, a degree that will prepare you to succeed as a practising artist or in a range of creative careers, and become an expert in developing artistic and creative responses to the big issues driving contemporary society. Taught by practising artists, this hands-on degree will give you skills in a range of media and the opportunity to broaden your education through electives on offer across the university. 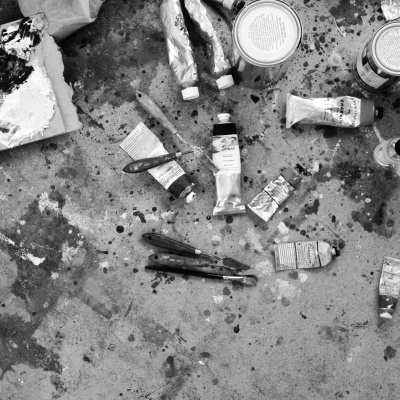 You can specialise in painting, photomedia, printmedia, screen arts, sculpture, jewellery and object, all underpinned by vigorous theory and critical studies. And with a unique part-time pathway, studying visual arts is now even more possible. DEADLINE EXTENDED UNTIL THE END OF AUGUST!!!!! This year we are taking submissions in 2 streams! drawing, painting, printmaking, graphic design or anything else you think fits here. anything that needs to be photographed, analogue or digital, sculpture, jewellery or anything else that fits here. A glass of red wine, white wine or a bottle of beer… great art on the walls, catching up with friends… That’s what you want from a week night between 6-8pm! Make sure you get out this week and see a couple of exhibitions! INSPIRE! 2013 Secondary Schools’ Art Prize. WASHED OUT – presented by La’ Division. Love Our Art & Your Sister! We are accepting proposal for exhibitions for 2014 . We welcome submissions from emerging or established artists across all disciplines to exhibit in our versatile gallery space. September 2013 – Australia’s first Drawing Festival and Sketchbook Drawing Trail. surface and structures inside our faces and bodies, such as veins, skeletons and muscles, resulting in dynamic works full of linear lines and structure. participants will have individual tuition at Norman Lindsay’s iconic National trust property and gardens. source plants and materials to explore and create with. Students will incorporate these into making paper and creating their own prints on the printing press. Workshop for Adults & Children – Rainforest Sketching with tutor Michael Herron includes a ride on the new Scenic Railway plus a tour of the rainforest with sketchbooks in hand. larger drawings using compositions arranged from your original observations. includes a sketchbook and map for self-guided Mountain destinations as part of the art trail. Each participant will have work shown in the competition exhibition. Selena Seifert on 02 4757 4791. ACGA Inaugural Conference at Sydney Contemporary 2013. The conference will take place Friday 20th & Saturday 21st September 2013 at Carriageworks, 245 Wilson St, Eveleigh NSW. There is a $50 entry fee for ACGA members and $75 for non-members. To book, call 03 952 7300 or email mail@acga.com.au. You asked for it! You are getting it! ACGA members $50 – Non-ACGA members $75 – Limited seats available book now! Due to loss of habitat in the Macquarie Marshes of northern NSW, Sydney city dwellers are now living with large numbers of White Ibises. The White Ibis (Threskiornis moluccus) is an indigenous Australian bird. To some people, the White Ibis symbolises the sacred Ibis worshiped by the Egyptians or the vast Australian land, to others it is an irritating nuisance. Alternate colloquial names include “Bin Chicken”, “Dump Chook” or “Tip Turkey”, from its habit of rummaging in garbage. It was known as Mardungurra among the Yindjibarndi people of the central and western Pilbara. We are looking for artworks that explore inner city living with the white Ibis…the pros and cons. We are after works that show your point of view…whather it is raising awareness of indiginous birds, evolution & extinction, or having them nick your child’s sandwich. 1) Who is Lisa Madigan? Beauty seeker, aesthetic hunter, salt shaker, art maker. 2) Explain your current body of work? I recently spent a month in New York & this new collection is absolutely a reflection of that experience. As with all of my work KALEIDOSCOPE treads the lines & explores the nuances between being grounded in earthly grits & depth & strength & a lighter, softer, more ethereal air. Spurred by particular fractures of light, dirty streets, punchy graffiti & vibrant colours melding with stormy spring skies & that skyscraper grey. The works embark on an almost documentarian journey of my collected moments, memories & sensations, one slipping into another, slipping into another, slipping into another. Not bound by form, but threaded with a common, underlying narrative. Substance & sensation. Light & dark. Elusive & punchy. Delicate & powerful. Frivolous & meaningful. Raw & polished. Beautiful. 3) If you can pick one artist as an inspiration, who would it be and why? Turner. He makes my heart soar, he surprises me, beguiles me & touches me with his luminosity, vision & sheer brilliance. 4) With your own art/art practice, where would you like to be in 10 years? Deep & fervent in my practice as a known professional. Pushing my own boundaries & immersed in the limitless adventures of creation & expression & connection. 5) How are you finding the current art market? My focus is on cultivating my practice & creating the best possible works I can. I believe if you’re doing what you’re meant to be doing with authenticity, tenacity, complete dedication & grace, things eventually will fall into place. If the work shines, it shines, regardless of what the market says, or what state the market is in. There has been an incredible buzz around the release of this new collection & I’m humbled & delighted with the response. I like to take it piece by piece & person by person. Not everyone will swoon for your work, but those who do, you hope it’s a somewhat transformative experience & you also hope there’s longevity to it. It can be a slow burn, things ebb & flow, but the more I move through my career, the more I own where I am, the more I connect, it’s a privilege. 6) Name four things, that you cannot do without in your studio? It’s a very raw & beautiful place for me & I’m more than happy with my bare essentials of fresh linen, an ample supply of paint, my knives & even just a single brush. My pieces move around a lot when I work, from the floor to the wall, so I need to have the space quite clear for a bit of room to manoeuvre, I also like it quite clear for my head space, it’s only ever what I’m currently working on that I like to be seeing when I’m in there. The studio itself certainly needs to be sitting just so, there’s a definite art of placement & harmony & light in my organised mess. 7) Is social media a help or a hinder for the arts and what are you thoughts? I absolutely believe in embracing new technologies for communication & there is such a vibrant, appreciative & diverse community to connect with in the social media stratosphere. It is such a wonderful opportunity to be able to connect in a beautifully immediate way with your audience, give them glimpses into the process & greater insights into the work. Love it. I’ve found social media invaluable & have made some truly amazing, genuine connections. It makes the world a smaller place, we are all connected & at the same time it makes the world a broader place & showcases our great diversity. Nothing can ever beat standing face to face with a work, ever, but I believe social media is allowing people a greater freedom of choice for which works they’d like to stand in front of & the freedom to find the Art that truly connects with them. 8) What was the funniest thing you’ve heard someone say about your own work? “When I saw your portraiture, I have to admit, I put you in a different category.” I think there are plenty who aren’t compelled to admire works that aren’t immediately obvious & who can only appreciate it once they know you can “actually paint”. Not so sure that’s funny though. 9) What is next on the agenda? There’s always plenty ripping at my chest eager to get out & there are some very exciting things on the horizon. I always say it’s a little like opening Pandora’s box, but stay tuned. 10) What is your advise to children who want to be artists? I would say for them to take a moment, a good long moment & be very, very quiet & listen to their inner voice to find out what it says. If their heart is calling them as an artist & if that voice never waivers, even through the dark days, then they need to express that & no matter what comes, they need to be true to who they are. If you are an artist, you don’t have a choice in the matter, so follow that road with courage, tenacity & grace. I had teachers try to make me change the way I held my pencil, to sit down instead of stand when I painted in class, one threw out an entire series of my paintings because I didn’t paint the way she wanted me to. In that way I’ve grown to become somewhat of a gentle rebel, if anything it strengthened my resolve rather than dismissed it. No one can tell you the direction of your work but yourself, trust that process, trust your self. 11) Where can we find more about Lisa Madigan? Have a great week and enjoy the Sydney Art scene. An exploration of digital aesthetics, sound and symphonic textures. @ 107 Projects Galleries – 107 Redfern Street, Redfern NSW 2016. Gallery Aloft is on the move again …out of the physical realm and into cyber space! Draw on the Mountain is an inaugural Art Festival featuring Workshops, Talks, Exhibitions, Events & Prize Winning Drawing Competition. Discover the beauty of the Blue Mountains all over again, or for the very first time – and you may even win some money! The Festival Program features workshops and master classes by some of Australia’s leading artists, including Wedderburn artists David Fairbairn and Suzanne Archer, renowned oil painter and landscape painter Lucy Culliton, Byron Bay’s Liz Powell, and local artists Michael Herron and Michiyo Miwa. Open to all people of all ages with workshops for all skill levels, experience and expertise. There are also special workshops for children and younger artists. The Drawing Festival includes the Sketchbook Art Trail – a self-guided/self-drive art experience, capturing World Heritage backdrops, iconic tourist attractions and less known natural locations in the Blue Mountains and surrounds. For those who do not want to drive, the festival has partnered with Blue Mountains Explorer Bus Service, with full weekend service (more details on attached pdf press release). Each participant will have work shown in the competition exhibition – with prize money of $5000 for overall winner (donated by Wild Valley Art Park). Wild Valley Art Park is owned by artist Selena Seifert and her husband and business partner, Jasper Russell. They bought this magnificent 17 acre property two years ago and together have transformed it into the Eco Arts Centre, Sculpture Garden and Artist Retreat it is today. Once the headquarters of Planet Ark and originally built as a sustainable village project by Mission Australia, Wild Valley Art Park is a unique, self-sufficient, beautifully presented bushland oasis. Letters are to be hand written and posted in an stamped envelope to the address below. All names will be reduced to initials, ensuring anonymity. Letters can be in any language. In sending the letter you are consenting to its use in an artwork and on the blog documenting this project. The Very Terry Reid Award was made possible due to generosity and vision of the artist Terry Reid with additional support by Hadley Green Company. AñA Wojak is an award winning cross-discipinary artist working in performance, painting, assemblage, installation and theatre design, with a particular interest in site-specificity. Based in Lismore NSW, her work has been shown extensively throughout Australia and internationally. She has worked with Tony Yap Co, Pacitti Co, La Pocha Nostra, senVoodoo (as co founder) and Felix Ruckert, amongst others. She has been exhibiting for over 30 years and was the recipient of the prestigious Blake Prize in 2004. Following this residency she is performing at undisclosed territories#7 International Performance Art Meeting in Java as well as Melaka Arts Festival, Malaysia. In 2014 she is designing The Pomegranate Cycle for Prometheus Opera and showing stepping stones… culmination of a 4 year project retracing ther family’s migration from Europe, at Lismore Regional Art Gallery. Terry Reid is credited with beginning the movement of Mail Art in the South Pacific and, with Taii Ashizawa and Kunimasa Kuriyama, internationalising Mail Art in Japan. Mail Art is a cross-cultural, intercontinental movement that began in the 1960s and involves sending visual art (but also music, sound art, poetry) through the postal system. Terry lives and works in Sydney and has maintained the practice of Mail Art since 1967. BigCi is an independent, artist run, not for profit micro artist residency program located in Bilpin on the edge of the World Heritage listed Greater Blue Mountains, about one and a half hours drive away from Sydney, Australia. Bilpin is a quiet, isolated place, with a population of around 500, scattered in a thin, long wedge of rural land sandwiched between Wollemi National Park and Blue Mountains National Park. The four-shop centre of Bilpin includes a small Post Office. Mail is not delivered to BigCi; it is personally collected at the Post Office. The ritual of the mail collection provides a point of social contact within the surrounds of pristine wilderness. The Post Office is located near to the beginning of the unsealed road, 820 meters from BigCi. Proposals for the Award needed to show how the artist wishes to respond to the environment of Bilpin and specifically utilise the Bilpin Post Office, relating it in some way to the art. And coming soon to the AGNSW? Get out and about and have a look at some art, it’s everywhere! To contact us, please email us at sydneygalleires@gmail.com with all your arts news and events. @ kind of — gallery – 118 Oxford Street, Darlinghurst. PSEUDO SPACE – Where have you been? Secret Identity – The Best Cosplay Burlesque SHOW in town! For 25 years, The Moran Prizes have been supporting the individuality of Australian artists and their talents. In celebration of Australia’s bicentennial, Doug and Greta Moran established the Moran Arts Foundation, aiming to foster portraiture skills. Since 2007, the Foundation has also been a strong supporter of excellence in photography. In a world focused on celebrity, The Moran Prizes are about the greatness in every Australian. Veteran art curator and director, Daniel Thomas AM will be again supporting The Moran Prizes, judging the 2013 portrait finalists along side Artist, Ben Quilty. This year, the Moran Prizes will be hosted at Juniper Hall, in Paddington (Sydney). Juniper Hall is set to become the permanent home of The Moran Arts Foundation Collection and the venue for the annual exhibition of the Moran Prizes. The historic Georgian building will become an important new exhibition space, displaying the winning works from this year’s competition. Click on the pictures for futher information. Have a great week. The I-Manifest STUDIO Pop-Up is a part of Vivid Ideas and The Rocks Pop Up initiative. This is the number one business technology event not to be missed – register now. I-Manifest Studio Seminar Day 2: TV, Radio, Print + Digital. Celebrate MCA ARTBAR driven by Audi first birthday this May as you experiment with the theme of weird science curated by Sydney artist Keg de Souza. From the 1985 teen sci-fi film classic by John Hughes to the literal meaning of weird science, Keg invites you to interpret the evening as you see fit. 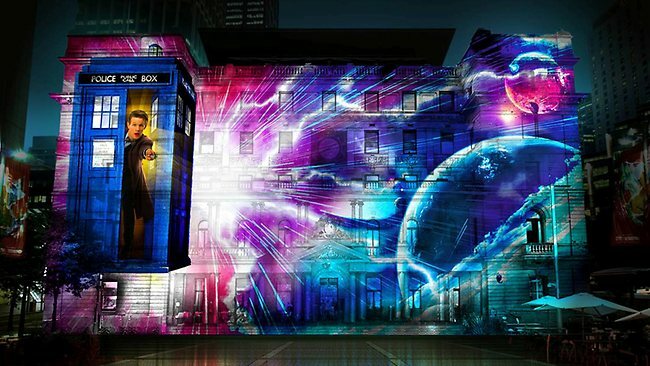 Vivid Sydney Doctor Who celebrates 50th Anniversary. Photo Vivid Sydney and BBC. 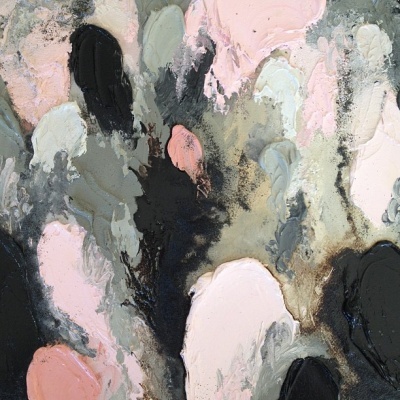 Mosman Art Gallery has opened the call for entries to the 66th annual Mosman Art Prize – presenting a public exhibition of finalists works from 13 July to 25 August 2013. Mosman Art Prize is a national painting award of $30,000. Sponsored by Mosman Council it is the longest running municipal art prize in Australia. The acquisitive award forms the basis of the Mosman Art Collection, a valuable and important survey of Australian painting. The Mosman Art Prize is Mosman Art Gallery’s flagship annual exhibition. This free public exhibition features selected finalists from a pool of established and emerging artists who work in oils, acrylics or watercolours. A Public Program of Artist Talks accompanies the exhibition offering insights to contemporary painting practice. Acclaimed artist Lucy Culliton will Judge this year’s award. Lucy won the Mosman Art Prize in 2000 for her work, Still Life/White Ground. The 2013 Mosman Art Prize awards a prize pool of $40,000 across the following categories: The Mosman Art Prize – $30,000 – major award (acquisitive), The Allan Gamble Memorial Art Prize – $3,000 (for built environment), The Mosman Art Prize Commendation Prize – $5,000, Young Emerging Artists’ Award (under 35 years) – $2,000 and the Mosman Art Society Viewers’ Choice Award – $1,000. Previous winners of the major Prize include David Fairbairn (2012), Craig Waddell (2010), Jasper Knight (2008), Adam Cullen and Tom Carment (joint winners 2005), Guan Wei (2001), Tim Johnson (1999), Elisabeth Cummings (1996), Jenny Sages (1994) and Nicholas Harding (1993). Margaret Olley was the inaugural winner in 1947. Entries and delivery of works close at 7:00pm Monday 1 July 2013. Finalists will be announced online 8 July. Looking for a space to develop your practice? 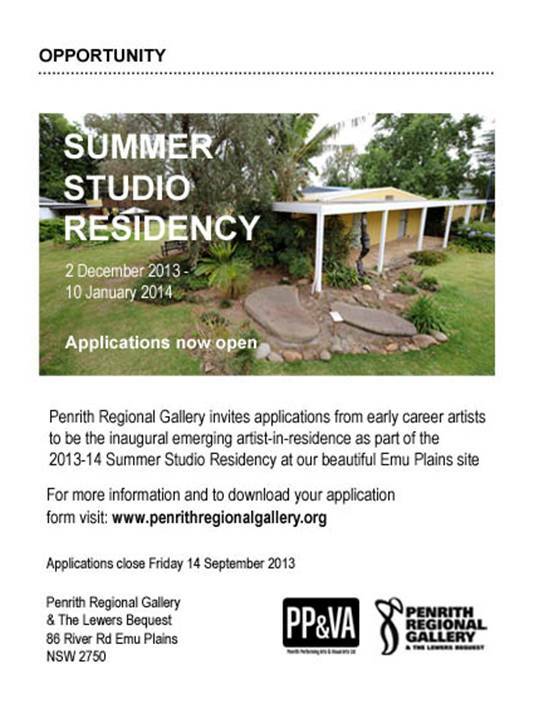 Artspace welcomes applications for 2014 Studio Residencies. Available to practicing artists for periods between two to twelve months, the studios provide a unique environment for artists to develop their practice. With a Federal election approaching, Solid Ground II: Echoes is an inquiry into the current debates pertaining to asylum seekers and refugees within Australia by bringing together a range of artists and writers, aiming to approach the subject by expressing a variety of viewpoints, observations and lived experiences. The aim of the exhibition is to focus on the facts of the current issues whilst considering Australia’s immigration history, international context and the political rhetoric and media sensationalism that has marred the issues and demonized ‘boat people’. The ‘White Australian’ policy of earlier decades demonstrates that Australian’s fear of outsiders is nothing new, yet the current polarization of the voting public reveals issues of underlying xenophobia that we have yet to shake off. At The Vanishing Point gallery, in association with OPEN Marrickville is calling for artists whose artworks/practices are engaged with the above subject and writers who are looking to be published with the show’s accompanying zine. All medium and contemporary visual arts practices are welcome to apply. Propose up to 5 artworks per artist. Proposals due 6pm Sunday 2 June. *Solid Ground II: Echoes is supported by funding from Marrickville Council’s Open Marrickville festival & ATVP’s Emerging Curator Mentorship program, supported by The Visual Arts and Craft Strategy and the NSW Government through Arts NSW. As you may have heard the new Dean (Ross Harley) has given his offices on the ground floor of D-block to the student body as exhibition or project spaces. These glass walled rooms look out on to the courtyard and are an amazing place to conduct performances, live art production, and exhibit installations. This new space is called The Fish Bowl. It will be open to any student* who wishes to use it. One room is for a week-long exhibition of work/ experimental project, another is a casual space to trial installation possibilities of your work for a few hours. All you need to do to gain access to these awesome new rooms is to send a proposal to the Courtyard Collective via the Arc Office at COFA. As long as you aren’t using anything problematic like a raging bonfire or litres of sulphuric acid, we’ll slot you in! *you must be an Arc member…it’s free! 10 Years !!! fundraise and submissions! It’s our 10th birthday! Hip hip..! We want to celebrate with a 10 years publication, wouldn’t you love to have one? We know you do! WE HAVE LAUNCHED our 1st crowd-funding campaign to fundraise and make this project possible! Visit http://www.pozible.com/kings10years, and have a look, donations of $10 and above will be rewarded!! We aim at producing a significant resource that will include a short history of Kings, interviews of founding members, critical essays and a series of 1 page artworks from Kings past exhibitors. Help us to make this project possible! The publication will be launched on October 4th 2013 to coincide with an exhibition including Cate Consandine, Kel Glaister, The Kingpins, Brendan Lee and Sanja Pahoki, curated by Anabelle Lacroix. CALL FOR SUBMISSIONS FOR THE PUBLICATION ! We are now calling on past exhibitors to submit an artwork, documentation, or response to be included as an image in the 10 years publication. Images can be a new or past work, a documentation of work exhibited at Kings or a response such as creative writing or anecdote. SP Gallery announces its next group show SHOCK AND AWE. This is a military term describing tactics to surpise and disturb the enemy. What does it mean in art? Show us what shocks and awes YOU. Wall works up to 1 metre in any direction, must be supplied with D rings and picture wire or cord. 3D works up to 1 metre in any direction. Audiovisual must be supplied on DVD. Artists welcome to provide own audiovisual equipments. Wallpeople is a collaborative art event that happens in 45 cities around the world at the same time. A city wall will become a makeshift outdoor gallery, where all participants may exhibit their own works and collaborate to create an improvised open-air museum. This year, Sydney joins the global network of creatives for the first time, and invites all city artists & creative enthusiasts alike to join us on the 1st of June in Newtown. Created in Barcelona in 2009, Wallpeople invites people to create and be a part of a unique experiment in an urban space, thus making an ephemeral street artwork. 1.Everyone can participate. You just need to join the event on Facebook. 2.On 1st of June at 12:00pm, go to Camperdown Memorial Rest Park in Newtown with one or more of your works. 3.Works will be accepted in any format: drawing, painting, illustration, photography, collage, paste-up, comics, paper, cardboard, wood (light), fabric, crochet, prints, mixed compositions, plates, postcards, craft, origami, album covers, vinyl, painted cassettes, a post-it, etc. 4.Stick your work(s) on the wall with the rest of the works. If your inspiration is a particular song, you must indicate the name of the track and the artist. 5.Wallpeople team will have the necessary adhesives but we still ENCOURAGE YOU TO BRING YOUR OWN MOUNTING TAPE OR ADHESIVE TAPE if possible, to facilitate the process. You can also BYO art supplies as we encourage all participants to make live art creations. 6.Wallpeople team will mark the start and ending of the event (about 3-4 hours). 7.At the end of the exhibition, you can take your work back or swap it with another participant’s, thus turning the event into an artistic exchange. If you want, you can write down your contact information, in case who took your work wants to contact you. • Light works, which can be stuck up to the wall with adhesive tape. • Any techniques or formats are permitted, provided that the work refers to a musical subject. • Works bigger than 1x1m. • Works that could cause damage to the wall. Drilling the wall is prohibited. • Works with offensive or discriminatory content. NOW ACCEPTING PROPOSALS TO 2013. By NEWTOWN HUB GALLERY . Newtown Hub Gallery in Sydney is currently accepting exhibition proposals from emerging and established artists. Cost of the Gallery $ 350 for week. You can pay instantly in one months , 15 days or one week before your exhibition. The Gallery open 2 – 7 Pm. Thursday and Sunday or for appointment. The gallery is opposite Oporto and 100 meters from Newtown Station.